← Donna Ball. Gun Shy. New York: Signet, 2007. Ryan Jakubsen. 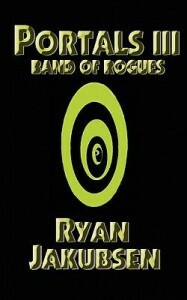 Portals III: Band of Rogues. Kernersville: Alabaster Publishing Company, 2011. In Ryan Jakubsen’s conclusion to the Portals trilogy, the Pierce brothers, dropped on Grandfather Mountain by a tornado and lost in other-world realms linked by portals, move through one final gateway. Their mission? To find home. Having fixed the portal that will transport them stateside, brothers Axel, Alex, and Exile are ready to say goodbye to their brother Jacob, the new warrior king of wolf-man hybrids, a faction of “manimals.” Joined by Lucy and Jackellel, the group ventures on, this time in a dimension where trees have eyes, ancient Pierce kin reign, manimal spiders joust, and the “shrockney” beatle conjures instant death. But control of the portals is unstable, and a War of the Rogues is blooming. When a written message from the Pierces to their hosts disappears by way of courier concussion, the company’s safety is jeopardized. The addition of mysterious newcomers Araknia and The Dark One keeps suspicion, lies, and allegiances ever-puzzling and occasionally deadly while the Pierces travel. Told by cosmic, animal, and human voices, the brothers’ story imaginatively beams from a spaceless battlefield to North Carolina locations like the UNC School of Law and the Blue Ridge Mountains. Families and their journeys are taken to new worlds in fifth-grader Ryan Jakubsen’s last installment of this series for young adult readers. Follow the portal home? If only it were that simple. 2 Responses to Ryan Jakubsen. Portals III: Band of Rogues. Kernersville: Alabaster Publishing Company, 2011.
thanks for the providing information about Rayan jakubsen . brothers’ story imaginatively beams from a spaceless battlefield to North Carolina locations like the UNC School of Law and the Blue Ridge Mountains. Its nice post full with inspiration, the concept told by cosmic, animal, and human voices, the brothers’ story imaginatively beams from a spaceless battlefield to North Carolina locations like the UNC School of Law and the Blue Ridge Mountains is spectacular. Thanks for sharing this…….